GH of Susquehanna Valley is committed to protecting homes in Central Pennsylvania from the elements, and we embody this philosophy in every project we undertake. 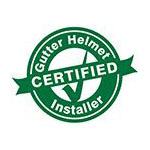 Backed by the trusted Gutter Helmet brand, we equip your roofs against the risks associated with debris clogging, animal infestation, and even water damage. Our gutter guards have a patented nose-forward design that allows only water to pass through, which reduces the risk of rot, dirt, and other similar issues inside your gutters. These guards can take up to 22 inches of rainwater each hour without overflowing, which will certainly curb any damage to your walls or foundation. Moreover, our Gutter Helmet gutter guards have comprehensive warranties. You assure yourself of a smart investment by getting a protection system that pays for itself in so many ways. Founded by Jeremy Seward in 2006, GH of Susquehanna Valley has since gone on to protect homes in eleven counties in Central PA. Our team of professionally-trained installers makes sure every existing issue is fixed with your gutter installation. As a small business, we also assure you of customized solutions suited to your specific project. You will find us attentive to your every need and request, and knowledgeable about your every concern and question. We also work quickly and quietly towards your complete satisfaction. Aside from metal seamless gutters, we also provide siding, soffit, and fascia services. Contact us at (800) 824-3772 to request a free quote or find out more about our solutions or you may fill out the form and we’ll contact you!